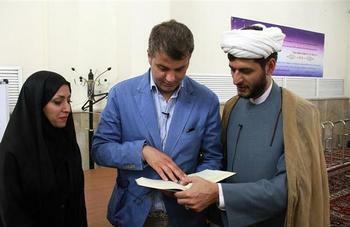 Tehran (AhlulBayt News Agency) - A Christian Italian attorney converted to Islam in the Razavi Holy Shrine. After making familiar with Italy residing Iranians, Luka Forni got acquainted with Islam and in his trip to Iran was influenced by the Shi’ite instructions resulting in embracing Shi’ite Islam. Attending in the Razavi Holy Shrine and by an enlightened selection, he chose a new life pathway for himself that was aligned with divine guidance. “I felt deeply happy and tranquil today when I attended in the Holy Shrine”, said the twin formulate of faith. It is notable that the cultural products including Qur’an and books in Italian language were donated to the new Muslim by Management of Non-Iranian Pilgrims of Astan Quds Razavi.